With the eCommerce module you can easily integrate a PayPal payment gateway into your order forms. You have to have a PayPal merchant account (Business or Premier account) to receive payments. SalesAutopilot can integrate PayPal Express Checkout process immediately. If you enable "PayPal Account Optional" option in PayPal you can receive payments from customers who don't have PayPal accounts. They have to type their credit card data directly into PayPal. First step is to setup API access for your PayPal account. Log in to your PayPal account and click the "Profile" option in the menu, then on the left side click "My Selling Tools", then on the right side click the "Update" link in the API access row. On the next screen click the "Request API Credentials" link. 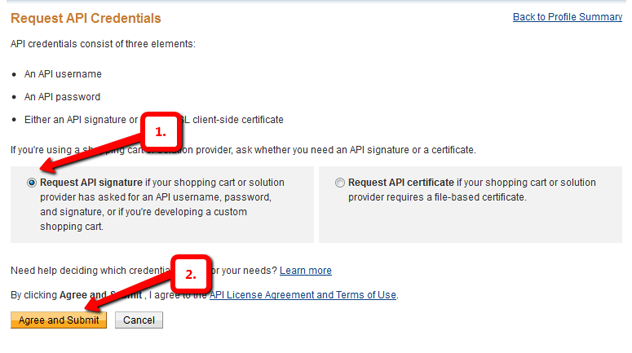 Make sure that the "Request API Signature" option is checked and click the "Agree and Submit" button. Now, you can see the required parameters for PayPal integration. These are the parameters required for SalesAutopilot integration. Log in to your SalesAutopilot account. In the left menu click the "Settings / Integration / Integration settings" option. Scroll down to PayPal settings. Copy PayPal integration parameters into the proper field. Copy the value of API Username into the "Username" field, copy API Password into the "Password" field, copy Signature into the "Signature" field. Then click the "Connect" button. If everything is fine you can see the text "Connection set"on the right side. In the left menu click the "Settings / eCommerce / Payment & Shipping methods" option. 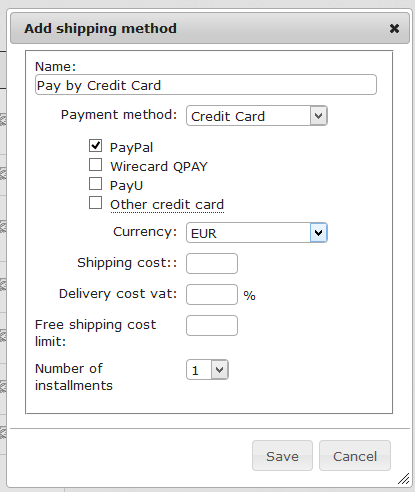 Create a new shipping method by clicking "Add shipping method"button. From the "Payment method" dropdown list, select the "Credit Card" option then check the PayPal checkbox. If you assign this payment method to an order form the PayPal option will be displayed on the form and your customers can pay you through PayPal.